I am on the CPANEL newer shared hosting and I have this problem that shows up randomly. The website may be working fine, and suddenly, it takes a very long time to get a response from the server. When I called Tech Support they brushed it off and said it was probably my images or video. The video is being served by Vimeo and the images are nothing big in today&apos;s standards. It adds to the problem that issue cannot be replicated on command, it happens sometimes only. By using pingdom, it is evident that it is not any of the content, but the sever is not responding quickly after the DNS resolves. What can I do? and the images are nothing big in today&apos;s standards. Whenever I see a statement with a premise, I know that all ok as long as I accept the premise, and I never accept out of hand. Just how big are &apos;todays standards&apos;? I wouldn&apos;t ever describe support as ever having brushed anything off, and believe me I have given them some stuff to think about. Sometimes it&apos;s not the server at fault, but your ISP. On a shared hosting account, what you are describing can happen many times, because the server&apos;s resources are shared with other sites. I&apos;ve seen that on one of the websites you are ussing Joomla, and there are a lot of way to implement a CDN for Joomla. Try that and maybe your site will speed up a bit. I&apos;ve had the long Time to First Byte problem happen before with my GoDaddy Linux/MySQL hosting, and I just started seeing it again yesterday. 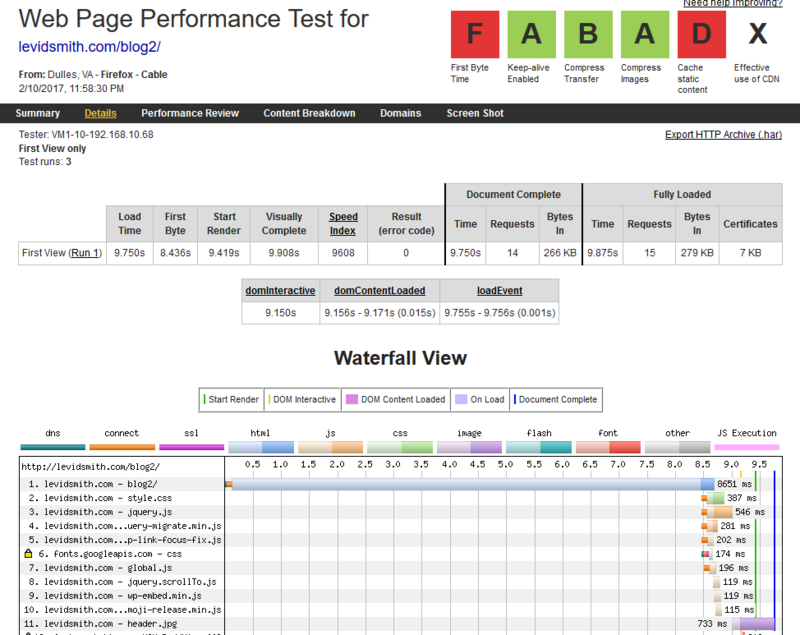 I use WebPageTest.org and GTmetrix.com to measure. I&apos;m currently seeing 10 to 13 second TTFB, although I&apos;ve seen it longer. I&apos;m running Wordpress and MediaWiki on my site. The odd thing is that I have test pages that I wrote myself that do not have this problem, which test PHP and query the MySQL database. I&apos;ve deleted/disabled all Wordpress plugins, which doesn&apos;t help. If I remember correctly, this problem occurred last time when a Wordpress plugin doesn&apos;t update properly. I went in through SSH and remove all of the files in the Wordpress plugin cache. Unfortunately, the way I resolved the problem last time was by creating a new database, and then migrating the old Wordpress data (through the Tools > Export option in Wordpress). It&apos;s a real time consuming process, but seems to resolve the problem. I&apos;m assuming it&apos;s because it moves the database to another server where there isn&apos;t as much lag. Update: As of 3:20am Eastern Time on February 11, 2017, the TTFB times are back to normal on my site (around 1 second). I&apos;ll be interested to see if they shoot back up during peak times. TTFB is very long, usually >3s, in extreme cases >10s. I am coming to belief that this is due to shared hosting, balancing limited resources across multiple sites with variable loads. This means that you&apos;re allocated a small amount of CPU, RAM and a certain number of concurrent connections to Apache per user. It seems that the limitations per users are *too harsh* giving the "expirience" that we all see. GD even made it more difficult for us to complain on the things that matters to us. I mean, phone contact is okay for those who prefers it but come on, there was no need to terminate written tickets, I do believe that there is significant number of users who prefer that over phone calls. I am encountering same problem here. The website is https://www.maisamali.com Please GoDaddy look into it. Time to First Byte high means loss of visitors.